The Internet retail giant, Amazon is expected to launch the next generation of its Kindle tablet lineup next week in an event in Los Angeles. The new lineup of tablets will most likely feature the second generation Kindle Fire mini tablet and the upgraded version of the company’s ebook readers like the Kindle Touch. But thanks to a few leaked images obtained by The Verge, we have now have an early sneak peek at how one of the ebooks might look. The leaked images show a tablet that seems to the Kindle Fire, which can be made out from the similar design but the device has now lost the button at the front and the color has gone quite a few shades darker, from light gray to a dark gray nearing black. The location of the USB ports and the power button also seem to be unchanged. The strange thing is the text that is displayed on the screen of the Kindle Touch, seen in the leaked image. The text is not in English but in French. (perhaps a promotional poster or something of the sort). 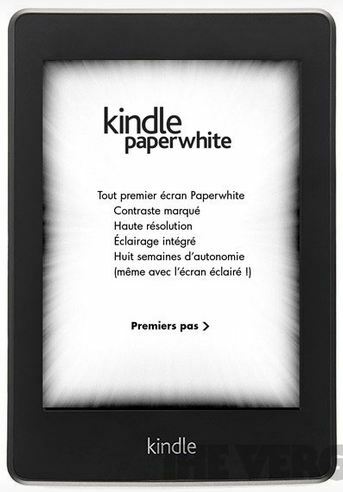 When translated it reads, “higher contrast, high resolution, integrated lighting, and eight weeks of battery life,” At the top, in bold, written is “Kindle paperwhite”. This clearly points at a revised Kindle touch that has an upgraded display, but whether it will sport the name “Paperwhite” at the time of launch is not clear. “Paperwhite” could also be referring to a new technology that has been used in the new generation of Kindle Touch, just like the present display tech used in the Kindle ebook readers are called Pearl E Ink. Apart from the new seven inch Kindle Fire and the next generation of ebook readers, rumors have it that Amazon could launch a 10 inch Kindle Fire to compete against Apple’s iPad directly, but there have been no proof in the form of “leaked images” or “leaked parts” on its part. An even wilder suggestion points at a Amazon smartphone, but this again seems highly unlikely.